As Project Humanities pauses to reflect on the past three years since its inception to make humanities more robust at ASU and across Arizona, we are pleased with the hundreds of public programs, lectures, film screenings, and other activities we have sponsored or co-sponsored across the Valley and with many ASU and community partners--all in an effort to build communities by talking, listening, connecting. 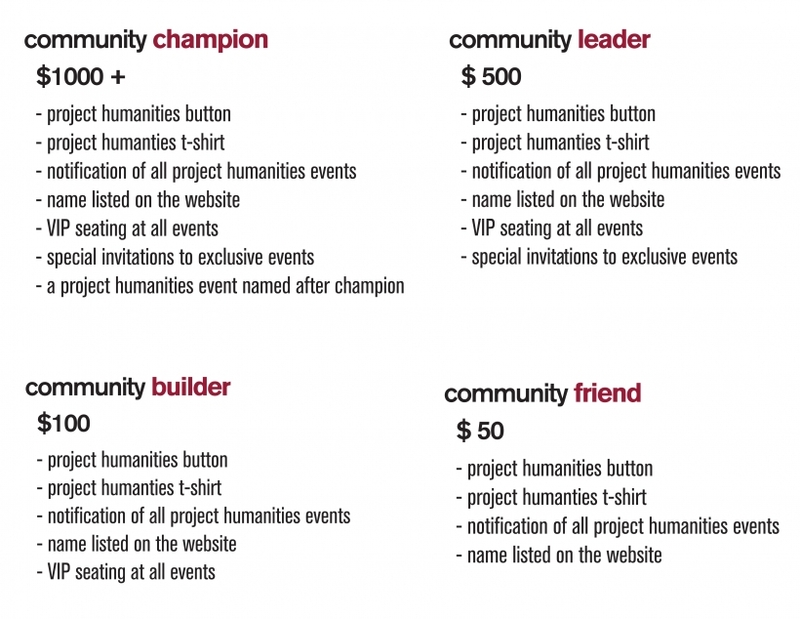 As a supporter of Project Humanities, you share the vision of creating a better world by challenging people to look for a connected human experience that will enable individuals to transcend place and current boundaries, to realize human potential, and to create new possibilities for building real communities. Our vision and drive will only grow stronger as we continue our efforts to improve our quality of life, both individually and collectively, while simultaneously striving to advance our newfound knowledge and understanding of place geographically and otherwise. As we put our efforts into action, we invite you to consider becoming a member of our new growing community: Friends of Project Humanities. This program recognizes the vital role each individual plays in this critical initiative. We invite you to become part of this Project Humanities community. You will join others who are committed to transforming and creating stronger individuals and communities. Consider joining in this effort by choosing one of four different investment levels identified below, each level offering specific benefits. The greatest benefit of this Friends program is knowing that your investment will advance community interaction by experiencing the humanities—art, film, literature, history, ethics, and so much more. … Project Humanities creates these experiences. Join us.